"This is a simple yet delicious recipe that takes little time to put together. It's a tasty way to incorporate a healthy, and often snubbed, vegetable into one's diet. I've been cooking Brussels sprouts this way for years. I'm not sure where I got the recipe. Using fresh Brussels sprouts is preferred naturally, but if not readily available, frozen Brussels sprouts may be used instead. If using frozen Brussels sprouts, you may have to drain any excess liquid that is rendered while cooking the sprouts." Place bacon in a large skillet and cook over medium-high heat, turning occasionally, until evenly browned, about 10 minutes. Drain the bacon slices on paper towels, retaining grease in the skillet. Crumble bacon. Cook and stir onion in the bacon grease over medium heat until translucent, about 5 minutes. Add Brussels sprouts; cook and stir until Brussels sprouts are lightly browned, about 5 minutes. Season Brussels sprouts mixture with salt and pepper. Sprinkle bacon over Brussels mixture and stir. Remove skillet from heat, transfer Brussels sprouts mixture to a serving bowl, and sprinkle with Parmesan cheese. 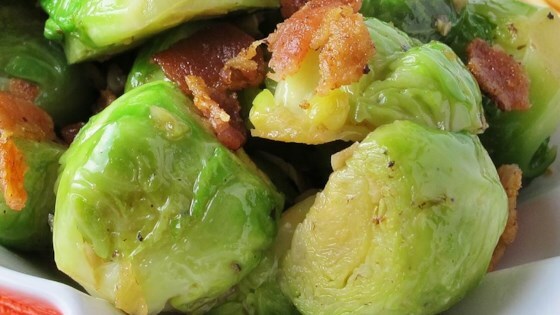 I love bacon and brussel sprouts so just wanted to see how others prepared it. Garlic seems a natural addition, just wondering why it wasn't included in the directions. ?? Easy and tasty. Only change was two dashes of Cayenne. Definitely a keeper. Great recipe! Disappeared quickly from the dinner table. It took a bit longer for me to get the brussel sprouts to brown then the recipe said but otherwise I kept everything the same. It was good. I followed the recipe though added more bacon just because. absolutely delic! easy to make. I put flat side down on skillet until charred. and then mixed all together.